You would think that knowing every form of hand-to-hand combat on Earth would be enough to subdue enemies, but more often than not Batman relies on his Bat-Cuffs to truly restrain criminals. 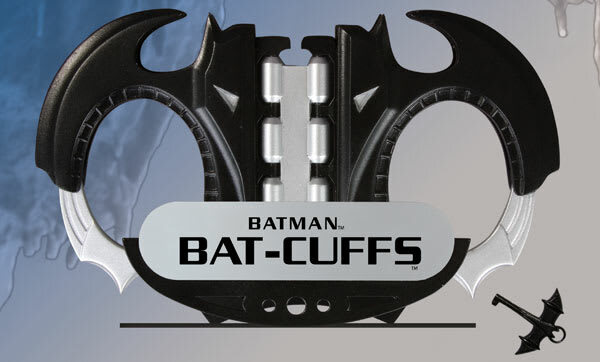 Often times shown as being in the shape of a bat (of course) these nearly-unbreakable cuffs are used after Batman clobbers a criminal and needs to leave them waiting for the police to arrive. Over the years he has built specialized cuffs for his more powerful enemies like Bane and Killer Croc, but they are often too bulky to be carried around all the time. More recently in the comics, these cuffs have been modernized to resemble the strong plastic handcuffs used in law enforcement.